I'm feeling a bit Japanese right now!! So we're gonna talk about a pure Japanese branch restaurant, well we actually went here months ago but have just been able to post it now, so sorry.. This place is called Robata Jinya, they go wayyy back in their history. Started out in a small area in Japan and spread out to America after being remade. And it has reached Jakarta from Hollywood, located in Gandaria City. The place has low lighting so it was a bit too dark, it also has strong Japanese concept. The paintings, the furniture, the pillars, the front entrance, it all screamed out Japan! There is one thing that really catches my eyes though, you see the small garden in the photo below? That was actually placed on the ceiling, so it's like an upside down garden. I was totally blown away! Don't believe me? Well, see for yourself. When we came here, there's a lunch special combo menu and we picked that. So, this was a combo of Ramen + Tokyo Curry with a total of only IDR 128K. The portion is reasonable even though for the low price. I actually thought the size would be super small or something, thank God it wasn't cause we're like super hungry at that time. The curry is really rich in taste and has a good amount of meat. I don't know if it was because I was hungry but I think this curry tastes amazing! Loved! It! Totally loved it! 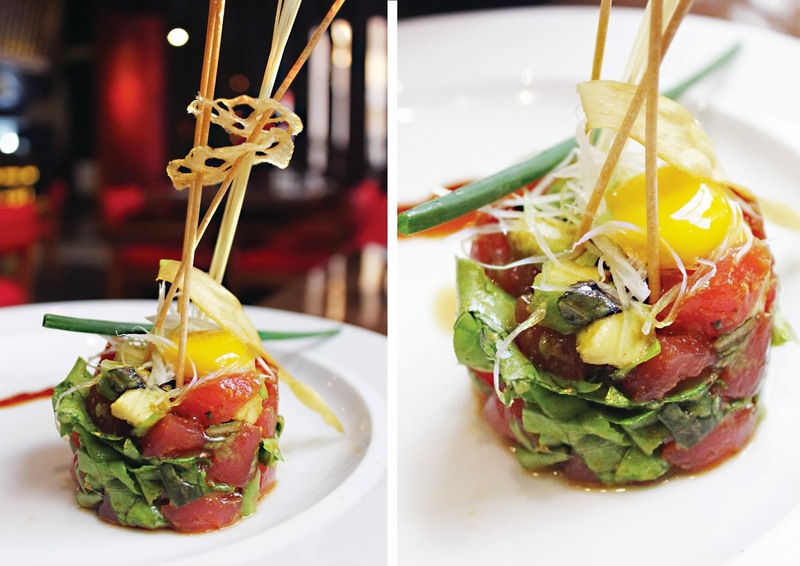 The freshness of the tuna and the combination with the avocado, plus the creamy yolk. Seriously heaven for your taste buds. I actually picked this because of the unique plating, but the taste was unexpectedly amazing. Must try!! It might not be a fun ride for those who doesn't like spicy foods but I think this is really good. The portion is enough for sharing, though I think I can finish this alone, it's just the bowl that is huge. All of the noodles used here are straight and chewy, soaked in rich and well seasoned broth with additional leeks and spinach.